The manual is aimed at new Int’l 420 sailors who would appreciate a detailed reference guide. I have tried to be as specific as possible when referring to the various rigging components, as nautical terminology can sometimes be confusing and lack consistency. Some basic sailing knowledge is assumed. Although there is no strict sequence required for all rigging tasks, the order of presentation is quite deliberate and based on what I have found works best for me. This document deals specifically with the International 420 as opposed to the Club 420. The Club 420 was originally made by Vanguard in the US, and its design is based on the International 420. The Club 420 design incorporates a number of modifications for intercollegiate sailing in the US. Although the two boats are different in a number of ways, many of the Club 420 sailing principals and handling characteristics are similar to the International 420. Many articles found on the Internet are for the Club 420, so be careful to identify which class is being referred to. If you have any comments about the manual or corrections that you think should be made, please post them here. Description: It is assumed that the mast has been pre-rigged with the spreaders and stays already configured, the halyards and spinnaker topping lift controls correctly integrated to the mast. Method: Check that the swage- hook-terminals at the top of the shrouds are securely seated in the bushed locating slot below the trapeze locating holes. If your trapeze cables are not in place fit them now, by placing the upper swage hook-terminal into the hole above the shroud-locating-slot. See right. NB. Before you fully extend the main and spinnaker halyards by pulling them down the outside of the mast, ensure that the back ends of these halyards are terminated with a figure 8 knot, to prevent them disappearing up through the base of the mast. Re-threading these halyards through the mast is no simple matter! Also check that the aft ends of the spinnaker pole uphaul/downhaul lines are similarly terminated so as to prevent them accidentally disappearing up into the mast. Method: Raising and seating the mast into position is difficult enough without having to repeat the process, so make sure that the forestay, jibstay, spinnaker and main halyards are pulled down the outside of the mast far enough so they will be accessible when the mast is raised into position. Next, make sure that all of the “dangly bits” are untangled and roughly in position. The forestay, jibstay and spinnaker halyard should be positioned forward of the spreaders and shrouds, while the trapeze cables and main halyard should be located aft of the spreaders and shrouds. A single person from the side of the boat can perform the mast installation, but the assistance of another person to steady the mast is desirable. NB. Before raising the mast check above for any obstructions such as powerlines etc. Stand the mast up beside the boat with the heel located aft of the step and the top of the mast slightly tilted backwards and towards you from the vertical position. Before you lift the mast vertically make sure that the four lines exiting the sheaves on the heel fitting are trailing aft so they do not interfere when mating the heel into the step. See far right. If you have an assistant, position them on the other side of the boat, forward of your position, and have them steady the mast with the forestay as you lift the mast vertically and then lower it into position, easing the heel gently into the step. Once the heel is firmly seated in the step, the mast should be eased forward into the mast gate. See right. When the mast rakes aft under its own weight and the forestay comes under tension, the widest section of the mast should be within the mast partners. See drawing, right. Method: Remove the clevis pin from the adjuster. Insert the shroud-swage-eye-terminator into the adjuster and replace the clevis pin so that the shroud cannot be removed. This is a safety device and it prevents the shroud coming loose from the adjuster if the fast pin were to disengage. It also helps hold the swage-eye-terminal in place while you adjust and pin it. See near right. If you have not already done so remove the fast pin (also known as quick release pin). Determine the adjustment position you intend to use (this is a judgement call, and affects the rake of the mast and rig tension). See far right. I use the 4th hole down or 71/2. This is a good starting point. If you have trouble pulling the eye terminal low enough to the desired pinning position, you can pull down on the trapeze to extend the shroud lower and at the same time lift the shroud adjuster (it has a few millimetres of play from its anchor point). Performing both of these tasks and attempting to pin the eye-terminal at the same time can be a bit tricky, and is made simpler if you have your assistant pull down on the trapeze while you pin the shroud. Finally, it is a good idea to wrap some adhesive tape around the adjuster, covering the protruding pins and their split rings. This will prevent catching spinnaker sheets or worse still, tearing the spinnaker cloth. Description: The trapeze cables are held clear of the spreaders and ready for use by a fairlead and shock cord system. Method: Take the shock cord loop and thread it through the small inner ring, then stretch it over the top of the large outer ring. Release the shock cord, then the trapeze ring. The trapeze cable is now out of the way and ready to use. Description: The Jib is rigged with an internal forestay that is threaded through the jib luff sleeve. When the jib is hoisted the rig is supported by the internal jib forestay and not the permanent forestay. After you raise the jib, you will notice that the permanent forestay is quite loose. When not in use, the jib forestay should be lightly coiled in such a way that the ends wrap around on the coil thus preventing the tension in the coil causing it to unravel. Do not attempt to coil the cable too tightly. This may cause a kink to form, damaging the cable. See right. Method: Unfurl the jib and unravel the jib forestay. Bring the jib-tack and the jib-stay swage-eye-terminal together and introduce the eye-terminal into the jib luff sleeve, just above the cringle. See below right. Now thread the jib forestay all the way up through the luff sleeve until the terminal emerges at the head of the sail. This is best accomplished by holding the tack of the sail in one hand while feeding the cable into the sleeve with the other hand. To avoid damage to the sail or the forestay during this process, have an assistant hold the head of the sail and keep the luff taught while you do this. Alternatively, if you do not have a helper, thread the transom pintle through the jib-head-cringle to hold the head end of the sail, while you keep the luff taught and feed the forestay in. This method can also be used to remove the cable. Next, locate the jib-stay swage-fork-terminal over the stemhead fitting such that the fork-eyes align with the rear hole of the stemhead. At the same time, position the Dee-shackle over the swage-fork-terminal, so that all four eyes align with the hole in the stemhead. Now secure all three parts together with the shackle pin. See near right. The jib tack cringle can now be secured to the Dee-shackle. I have used 3mm spectra rope. Start with a bowline through the cringle, then down and through the shackle, a rolling hitch away from the shackle, then up and through the cringle again. Finish with two half hitches locking below the first rolling hitch.. The object here is to keep the tack secured and close to the deck. I use a similar method to secure the jib head to the jib halyard via a Long Dee-shackle. First, pass the shackle through the jib-halyard-thimble and pin it to the jib-stay-swage-terminal. Secure the jib-head-cringle with a bowline, pass the rope up through the shackle, a rolling hitch away from the shackle, then down through the cringle again and finish with a two half hitches, locking above the first rolling hitch. The tension on this linkage is critical to achieving the correct luff tension on the jib. See above right. Method: Before raising the jib, slacken and extend the rig tensioning system up to where the jib halyard strop exits the mast. Also check aloft to see that the cable halyard is not tangled with any other lines. Take hold of the jib halyard-strop and pull it down by hand until the cable-loop-termination of the jib halyard appears from inside the mast. Secure the jib in the raised position by attaching the rig tensioner snapshackle to the wire loop. See “Tensioning the Rig” next section. Description: The rig tensioner or rig tensioning system is made up of two blocks with six sheaves and one cam cleat, threaded with a 4mm rope tail. The upper block is permanently attached to a fixed-eye snapshackle that is used to connect the tensioning system to the jib halyard loop termination. See right. The lower block and cam cleat is permanently attached to the mast. See below right. Having attached the snapshackle to the wire loop, the rig can now be tensioned according to the prevailing sailing conditions. See tuning guide for your sails or consult others such as this one by SpeedSails. Description: The jib sheet is permanently rigged as follows:- The sheet passes through a fairlead and a cam cleat on one side tank, across the cockpit, and continues through another cam cleat and fairlead on the other side tank. Both ends of the jib-sheet are terminated with an eye splice. See below left. The jib sheet is rigged to form a continuous loop around the mast. The sheet-ends and jib-clew are joined together with a short link-rope. One end of the link-rope has a permanent figure 8 stopper knot. The other end is passed through the first eye splice, the clew cringle, the second eye splice, and terminated with another figure 8 stopper knot. This arrangement effectively locks the clew together with the jib sheet-ends. Alternatively you could use a Long Dee-shackle. See below left. Method: Presumably, your mainsail was previously rolled up from the head to foot. If this is the case orient the sail along the centre line of the boat so that the clew end is aft and the tack end is forward. Having done this, then you only need to unwind enough of the sail to completely expose the foot. See right. Now you can begin to thread the sail onto the boom within the confines of the hull, while the sail is still in a mostly rolled up and manageable state (especially if it is windy). Have your assistant stand near the mast and hold the tack end of the foot. 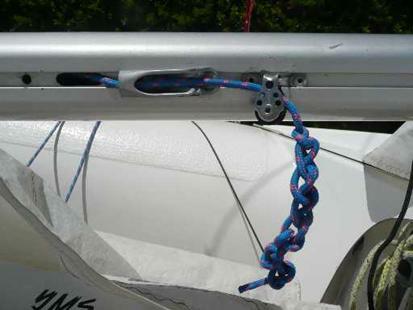 Alternatively, if you are rigging the boat on your own, you can temporarily tie the tack to the Cunningham. See below. Standing behind the transom, grasp the clew end and pull the foot taught. Introduce the clew-slug into the inboard end of the boom track and ease the boom forward. See below. Ease the tack inboard end of the boom towards the mast. Continue this process until the slug is close to the outboard end of the boom. Running the boom onto the boltrope in this way (as opposed to pulling the sail onto the boom) retains control over the mainsail in its partially rolled up state and puts less stress on the sail. See right. Secure the clew-slug with the line attached to the outboard end of the boom. No tension is required on this line. It is only there to limit the inboard travel of the clew and allow the boom to be raised together with the mainsail. Description: I use a simple noose or overhand slip knot to secure the mainsail halyard to the mainsail-head cringle. Method: Pass the working end of the halyard through the cringle, tie a double-overhand stopper knot at the working end, and finish by tying an overhand knot around the halyard. See below. NB. It is critical that this knot is secure. If it were to come lose, you may not be able to get the mainsail back up! Once the head is attached, feed the luff-boltrope into the mast track. This is best accomplished by standing on the port side. Put enough tension on the halyard to hold the head a few inches up into the track, and then temporarily cleat the halyard through the port clam cleat near the bottom of the mast. See above left and right. Continue raising the mainsail by hauling on the halyard while at the same time feeding the luff bolt rope into the mast track, tacking care not to snag the boltrope at the mast track entry point. As the mainsail head approaches the upper end of the mast, the inboard boom-end should be supported and engaged with the gooseneck spigot. Temporarily cleat the main halyard at this point and secure the mainsail tack (see next section). Description: I use a length of rope to secure the tack to the mast. This also locks the boom to the gooseneck. Method: The rope is deadended or permanently secured to the gooseneck with a bowline. Pass the working end up through the cringle, then around the mast and through the cringle, twice, then down and under the gooseneck fitting, then up and down through the spinnaker-pole ring. See near right. Finnish off securely with a rolling hitch and two half hitches. See far right. Place enough tension on this knot to hold the tack securely down and close to the mast. This anchors the tack in place, against which, both the outhaul and main halyard are tensioned. The mainsail can now be fully raised and cleated off. NB Not too tight! Luff tension is adjusted with the Cunningham (see next). Method: The Cunningham is dead-ended (or secured) to the gooseneck with a bowline. The working end is passed up and through the Cunningham cringle and down through the clam cleat below the boom on the starboard side. Adjust the Cunningham tension according to the prevailing sailing conditions. Method: Un-cleat the inboard end of the outhaul. See below left. Thread the outboard end of the outhaul over the boom-end sheave, through the clew cringle, across the outhaul-guide, tension the line slightly, and cleat off, over the jam cleat. See below right. NB. Remember, outhaul tension is applied at the inboard end of the outhaul. See below left. Wrap the working end of the outhaul around the bottom end of the outhaul-sheave, through the cringle, and secure back over itself with two half hitches. See right. Set the outhaul tension according to wether conditions. Description: The International 420 uses a four-block centre mainsheet system. The mainsheet is dead-ended to the block that is connected to the bridle (bridle block). Method: The sheet is routed up between the two boom blocks, forward through the smaller forward block, down and aft through the bridle block, back up between the two boom blocks, aft through the bigger rear block, and down through the block and cam-cleat that is mounted on the centreboard case. See right and below. Description: The bridle has two positions. One for light winds and one for heavy conditions. For light conditions the bridle is lengthened and the tie balls are released from the snap-hook-shackles. Method: Fully release the vang rope tail so that the system is fully extended. See right. Grasp the vang system at the snapshackle and thread it underneath the centreboard uphaul, taking care that it is clear of all other lines. Attach the single block (with becket and universal head) via Dee-shackle to the permanently fixed hanger near the base of the mast. See right. Now attach the single loop snapshackle to the boom hanger. See below left. Three movable blocks supported by 6 runs of rope. See below right. Adjust the boom vang when underway, according to the conditions. Description: The boat has two side buoyancy tanks and one bow tank. Each tank has one inspection hatch and one drain plug. Method: Insert and tighten all three drain plugs. Fit and tighten all three inspection hatch covers. Description: The rudder assembly consists of a aluminium tiller and Dee shaped rudderstock. The rudder assembly is permanently rigged with a retaining clip, secured on a length of rope and a rudder-locking pin secured on a length of shock cord. The rudder assembly is fitted to the hull via the transom rudder-pintles. The rudder-blade or foil is fitted to the rudder assembly with a pivot bolt (bolt and nyloc nut) A telescopic tiller extension is fitted to the tiller with a urethane universal join. Method: Guide the upper and lower, pintle guide holes, down over the rudder-pintles. Pin the top pintle with the safety-retaining clip. See right. NB. The retaining clip prevents rudder dislodgement from the hull in the event of a capsize. Remove the bolt and nyloc nut from the rudderstock gudgeons. Slide the rudder-blade-head into the rudderstock so the straight edge of the foil is facing forward when in the raised position. See right. Secure the rudder-head in the rudderstock by locating the pivot bolt through the rudderstock-gudgeons and the rudder-head pivot hole. Thread the nyloc nut to the pivot bolt. Use just enough tension so that the rudder-head can swivel but with enough friction that the rudder is retained in the raised position when placed there. See below. When underway the rudder-blade is rotated into the fully down position and the rudder-locking pin engaged through the rudder-locking hole. See right. NB. To avoid damage to the foil, remove this pin and partially raise the rudder-blade just before you return to shore/shallow water. Description: The centreboard rotates forward and aft about the centreboard pivot pin, which is retained within the centreboard case. When fully raised the centreboard does not project below the hull surface, while the trailing edge is exposed above the centreboard case. See below. Picture C1 right, shows the centreboard in the fully raised position. To lower the centreboard you must first release the port or starboard uphaul from its respective clam cleat. See picture C3 below. The crew pulls up and aft on the centreboard handle. This action lowers the centreboard by rotating it forward. The centreboard downhaul, by virtue of the shock cord tension, assists with this movement and helps retain the centreboard in the fully down position. See right and below. The downhaul consists of a length of rope permanently fastened to the centreboard handle which travels aft along the centreboard capping until it is directed underneath the capping and forward by a bush seated in the centreboard capping. The downhaul is terminated to a floating plastic cleat. A length of shock cord is threaded through the cleat. The cleat can be moved forward or aft along the shock cord to adjust the tension on the downhaul. See right. 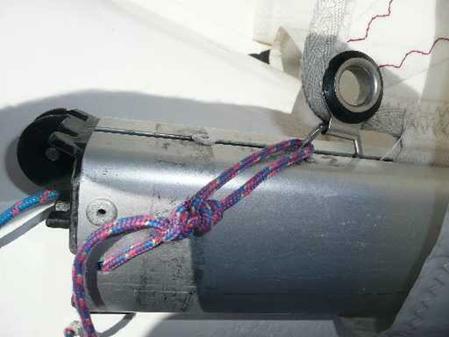 The uphaul rope is permanently rigged through a block attached to the centreboard handle (See Picture C1 above). Two blocks rout it aft. One on each side of the boat. See right. The uphaul travels aft along the buoyancy tanks on both sides of the boat and is secured by a port and starboard clam cleat with integrated fairlead. Both ends of the uphaul are terminated with a figure 8 stopper knot to prevent them being pulled back though the clam-cleat fairlead. To raise the centreboard the helmsman pulls either the port or starboard uphaul while its opposite end is cleated off. This action raises the centreboard into the centreboard case by rotating it aft. Description: The transom drainage flaps are held normally closed by shock cord until boat speed and accumulated water, force the flaps open and the water drains out. The 420 is allowed one automatic self bailer. See below. Remove drain plugs and inspection hatches. While mounted on the dolly, raise the bow of the boat and allow any accumulated water in the buoyancy tanks to drain. Release tension on all shock cord rigging. This helps preserve them. GrayMed - LW Scientific Centrifuge Deals in Australia - At GrayMed Australia, we offer great prices on tabletop laboratory centrifuges. From the tiny ZIPocrit, through to the highly advanced C5 swing-out model. LW Scientific Microscope Deals in Australia - At GrayMed, we offer great prices on the LW microscope line-up. From the Student-Pro, through to the highly advanced Mi5 LabScope.